Plus I finished all of the cookies yesterday. As good decisions go, this one isn’t too hard to get behind. Quinoa is everyone’s favorite ancient whole grain — high not only in protein and fiber but also in popularity, you know? A solid start to our salad. We’ll add some bright, crunchy vegetables and some firm, baked tofu, then dress it all with an Asian-inspired dressing — one that’s easy to throw together and out-of-this-world good. It’s got all of our bases covered — rich with toasted sesame oil, sweet with honey; it gets some spice from our old friend Sriracha, salt from dark soy sauce, and a tangy bite from the addition of rice wine vinegar. If we can’t have cookies for lunch, this will surely do. I didn’t think to add them, but a handful of roasted, salted peanuts or cashews would be a great addition to this bright and spicy salad. Do as I say, not as I do? Also, to make this full-out, serious vegan, simply swap agave syrup for the honey in the dressing. Vegans are people, too (I’m told). Mix quinoa, water, olive oil and a pinch of salt in a medium saucepan. Bring the quinoa to a boil over high heat. As soon as it starts to boil, cover the pot, lower the heat, and simmer quinoa until it has soaked up all the water and is translucent at the edges. 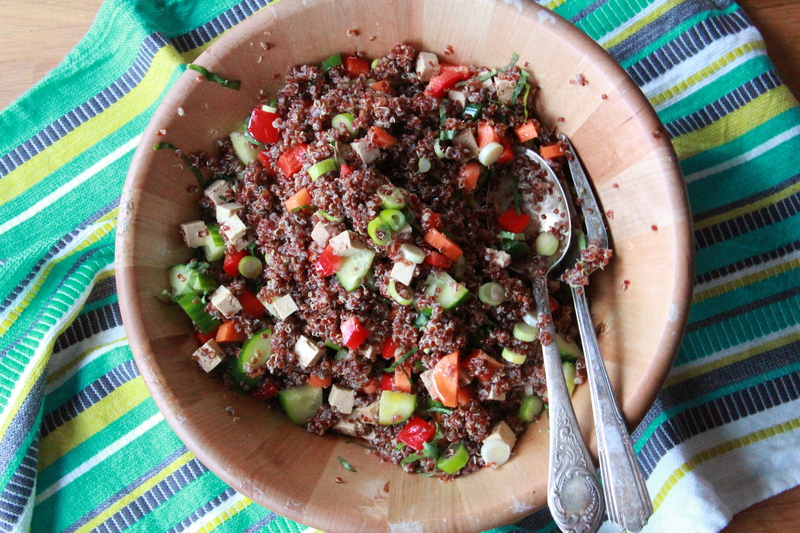 Fluff it up with a fork, then transfer hot quinoa to a large bowl. 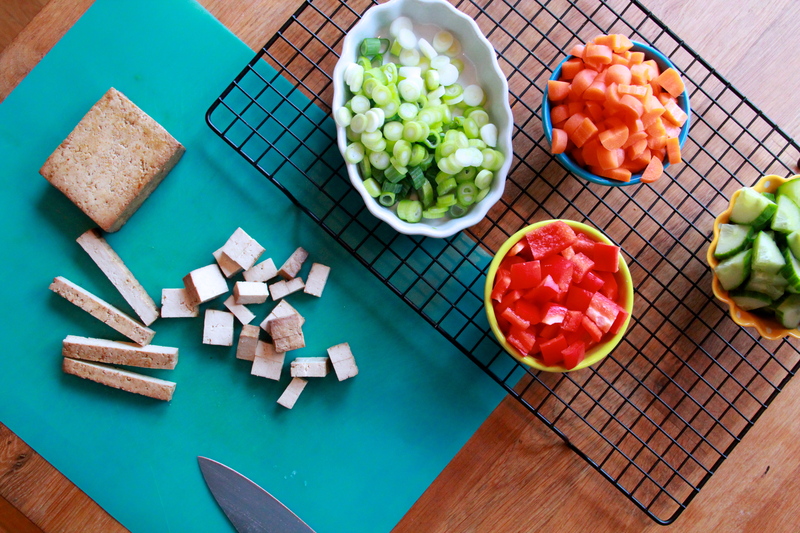 While quinoa cooks, chop up your veggies and make the dressing. To make the dressing, whisk together (or shake up in a tightly closed jar) the vegetable oil, soy sauce, rice vinegar, honey, chili sauce and toasted sesame oil until smooth and emulsified. 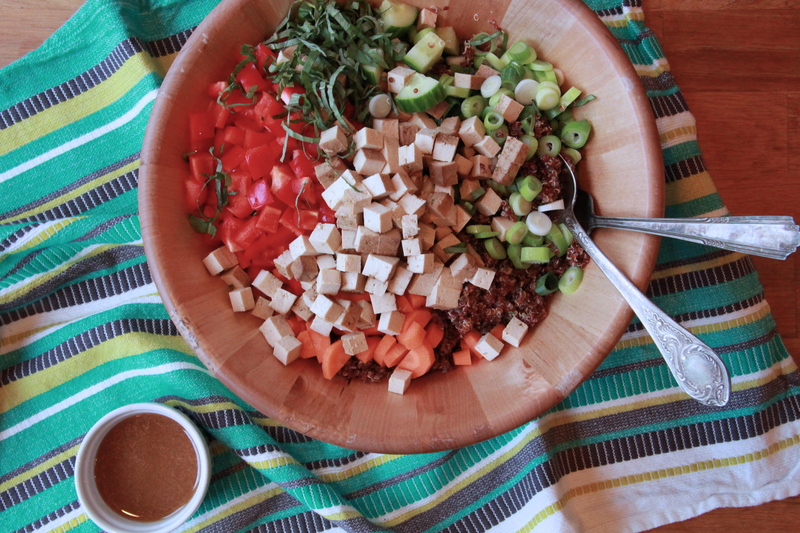 Place vegetables and tofu in the bowl with the quinoa, and pour the dressing on top of it all. 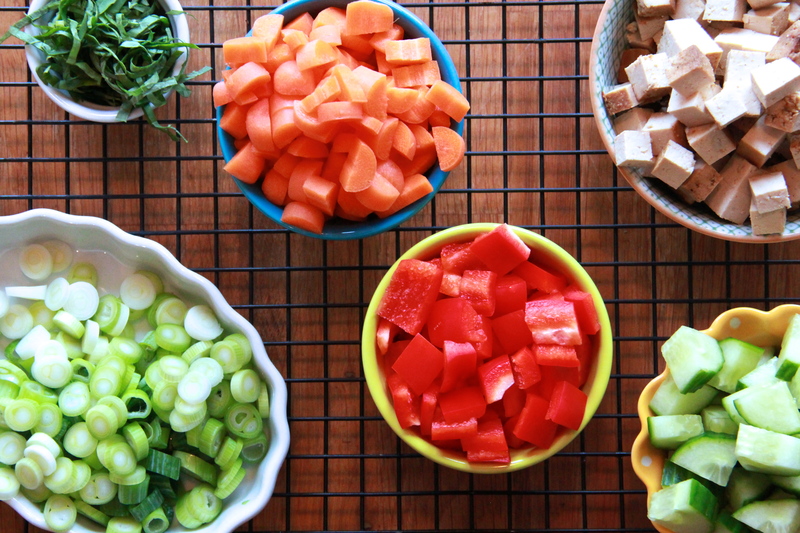 Toss everything together until quinoa and veggies are well-mixed and the dressing is evenly distributed. Makes about 10 cups salad. Have fun on your holiday! Lord knows you’ve earned it if you can muster up the strength to eat a salad on a cold and drizzly day. Something I have never been able to do. If any salad could tempt me though, it might be this one!